Please note: Due to snowy conditions on beautiful Vancouver Island, the folks at KidCareCanada were not able to physically get together to do the draw. We have decided to move the draw date to Tuesday, Feb 19, after Family Day. Please see below for information about the contest – there is still time to enter and you only need to write a few words. Have you a favourite KidCareCanada resource, maybe a video or a comment from our ABC’s book, that has influenced the way you interact with your child? 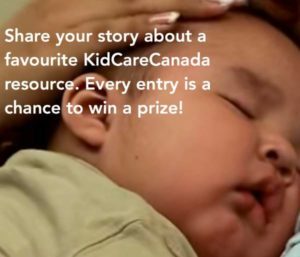 KidCareCanada has created a “Share Your Story” campaign for the New Year – with a draw for a special gift on Valentine’s Day to show our love for our community of parents, childcare professionals and caregivers. We are calling for your entries NOW! or find us on Facebook https://www.facebook.com/kidcarecanada/photos/a.470743826288265/2390529754309653/?type=3&theater and post your story on our timeline!